In many markets, real estate has bounced back from the dark days of the 2008 financial crisis. People who buy real estate using their tax-advantaged retirement accounts are contributing to that market rebound. According to RealtyTrac®, foreclosures were down 4% from 2015 levels in January, and home sales were up 27% over December. Nationwide, median sale prices are edging back up, and in some urban markets properties regularly sell for over the asking price. Among Entrust clients, real estate purchases increased by 21% year-over-year between 2014 and 2015. And the trend is not slowing down. The benefits are apparent: the revenue generated by the property is not taxable and the value of the asset grows tax-deferred as well. Despite these advantages, some people are put off by the thought of all the paperwork and bookkeeping required. The Entrust Group myDirection Visa® Prepaid Card takes care of those worries. With a simple swipe of the card, you can pay for contractor services, renovations, regular expenses like utility bills and property management services. You can even pay your property taxes. Even better, all of your transactions can be managed through the Entrust Client Portal. 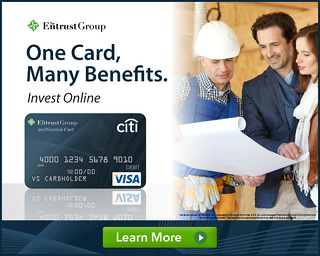 The Entrust Group myDirection Visa® Card is an easy, low-cost way to manage and monitor your real estate assets. It is not a credit card, but a debit card that gives you full access to the cash in your Real Estate IRA. The low $25 set-up fee and $3/month maintenance fee more than makes up for the check request fees (up to $10 per check) you might otherwise rack up managing your property. You can manage your account online when it’s convenient for you, thanks to 24/7 access and support. You can add funds to your account and schedule distribution payouts. Transactions are certified within minutes on the Entrust Client Portal. Signing up for The Entrust Group myDirection Visa® Card is easy. You just need to fund an IRA account with Entrust, log in to the Entrust Client Portal, and request the card. Now you’re ready to start managing your real estate the convenient, secure way. You’ll save time and money and you’ll gain peace of mind. If you're new to Entrust, please click on the banner below to get started. Disclaimer: Cards are issued by Citibank, N.A. pursuant to a license from Visa U.S.A. Inc. and managed TheEntrustGroup.com/myDirection by Citi Prepaid Services. This card can be used everywhere Visa debit cards are accepted.